I knew from early on I wanted Little D to be interested in books. I wanted to promote brain development as early as I could or at least to get him interested in books. I wasn't into reading growing up and it wasn't until I became an adult that I absolutely fell in love with it. I love just being immersed in a book and seeing the story play out in your head. So shortly after I had my son, I tried making it part of our bedtime routine to read a book to him every night. It started out well, I could see him following along as I read, looking at the pictures and sometimes even touching the pages. It was also a great time to just sit with him and bond, even now as a one year old he associates reading with mama! Eventually, he would start picking up books on his own and just flip through them. Today, he'll pick up a book and pretend to read out loud just babbling away. He can even remember certain animals we've identified with sounds like a lion and repeat the sound a lion makes when I ask him. As the months went on and Little D's night time routine changed we had to evaluate when we would do the night time reading and cut to today, I try to do reading whenever the opportunity presents itself. As much as I would love for it to be every night, it's not always possible. One of the things I made sure to do was to keep books wherever I knew he would be. We keep a basket in his play area that is usually full of board books and in his room where I have them displayed above his changing dresser, I will give him one while I'm changing him, it's a fantastic distraction for a wiggly toddler. He really does gravitate to the books whenever he is playing. A lot of times he will grab a book and bring it to me just so I can turn the pages or read a few sentences. He'll usually take it back from me and continue to flip through it. I don't think anyone needs to be interested or even a good reader to try and promote that for their kids. I recently found an app on the iPad that had Disney Storybooks. What was great about the app is that it will give you the option to either read for yourself or have it read to you. So if someone wasn't big on reading themselves, I feel like this app would be a great way to promote reading in a really fun way. 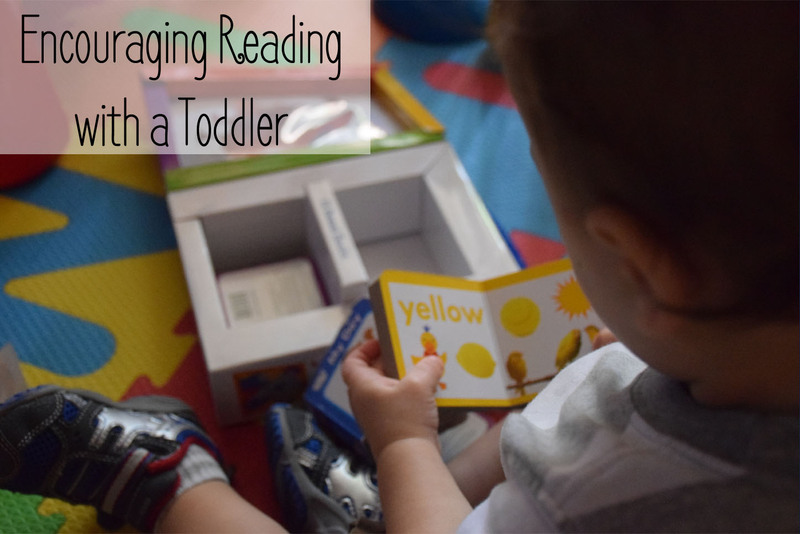 The words highlight so that you can follow along and if you wanted to sit with your little one and watch with them, not only are you encouraging reading but you're also taking advantage of an opportunity to bond. I would totally recommend board books, they hold up really well and it's not as easy for little ones to rip the pages. Some of my favorite ones to keep around are Baby Einstein (there are so many different ones to chose from), Baby Touch and Feel board books, and Dr. Seuss board books. It's never too late to start reading, seek out those opportunities even if they're in small doses because the benefits are worth so much more once they're older. This is not to say that a child who isn't read to will never love reading or won't be smart - it's totally possible for a child to grow into reading and be highly intelligent and not be a great reader. Everyone is different and life has taught us that anything is possible. What's In My Diaper Bag - Toddler Edition! FINALLY! I've been saying I wanted to do a "What's In My Diaper Bag" post forever and I actually got around to doing it. We were heading to my in-laws and since I was restocking my bag I thought, let's bust out the camera. 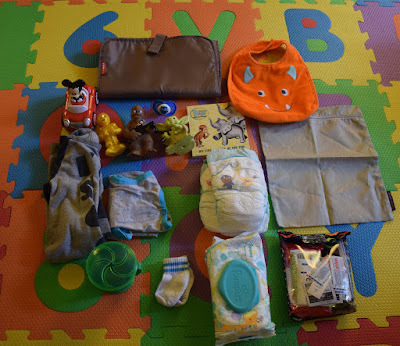 I've done a review on this diaper bag before (you can read about it here) and I did a quick Diaper Bag Essentials (also available here) but this is a look into what I actually pack. This is not always a standard thing every time but this is most of it. 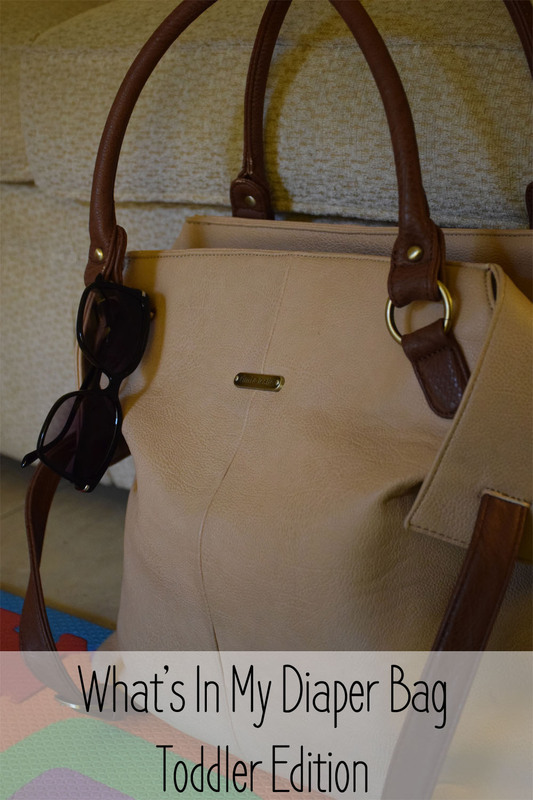 First, my diaper bag is by Timi & Leslie, it's from the Convertible Collection and it's the Charlie in Sand/Cinnamon (details here). I absolutely love this bag! I wanted something that looked like a purse and had a lot of functionality but was big because I have an obsession with big bags. The price of this bag is $159.99, a little pricey for a diaper bag but this baby comes with a lot of goodies and it's my bag for the next five years, I want something that will last and I can live with for that long. An item not pictured is a sippy cup, I usually keep it in the fridge until I'm ready to head out. Items not pictured is a bottle of water and a snack - mom can get hangry sometimes. And that's it! It looks like a lot of stuff and trust me this bag can get super heavy but apparently kids come with a lot of crap - it kind of doesn't help that mom comes with a lot of crap too. I may have to re-evaluate when another baby comes along! I recently read an article posted on Mom Wife Woman where she wrote 4 Reasons Why You Won't See My Kid's Faces In Your Newsfeed and she talks about why she keeps her kids photos off the internet and I think it's a great reminder, especially as bloggers, why we need to be more cautious when posting pictures of our children. When I first started blogging, I struggled with whether or not to show photos of my son. In the beginning I would try to show only side profiles or the back of his head but then I decided to go ahead and show him. It was hard and scary at first because it's the internet - I don't know the people reading this blog just as much as you don't know who I am. I don't know your background, I don't know you history and I don't know your intentions. One of the points Mom Wife Woman made was that people will take photos of children and post them as if they were their own child. I remember seeing this on the news and it freaked me the f**k out! Was I doing something wrong by showing photos of my son? Here are people, perhaps some who are just lonely and unable to have children, taking your child's photo and using it for their own purposes. That's a huge violation to me and my child. On a level I could understand their reasoning but on the other it's incredibly creepy. I want to be able to connect with my readers and I want to be able to share my stories as a mother but at what point am I doing too much? You then have the more obvious and most scary side of the internet and it's the creepers and perverts who use your child's photo for the most inexcusable actions imaginable. Thinking about it makes me sick to my stomach. In an age where we are so involved with the internet, there's Facebook, Instagram, Twitter, SnapChat - we've become a generation of oversharers inevitably leaving ourselves exposed to these people for the instant gratification that 50 people liked our post. People that steal photos is almost equivalent to peeping toms who use to hang out windows expect now, they're in their homes behind a monitor. It's incredible the violation they can do with just a few clicks of a mouse. I wonder where we got this insatiable need to have our lives validated? Is it the idea that everything we do matters? That our kids are the cutest we need everyone to see it? Perhaps it's the instant infamey we gain for from just sharing our daily life - YouTube, Vines. I'm just like other people, I have blogs I love reading and YouTube vloggers I enjoy watching but I wonder what in our minds justifies or rather ignores the risk. Some might look at this and call me the biggest hypocrite with my postings of my son's birthday, weekends and inner workings of my parenting and maybe I am. But I want to be able to be as cautious as I can be - I don't use my husband or my son's name anywhere in this blog, I blur out anything that might reference to it and I try to avoid specific references to where I live. We need to make sure we have an understanding of the magnitude the internet has - so many people can see your life even when we don't realize it. Remember our babies need to be protected and the minute I feel something isn't right, well you'll just have deal with seeing pics of just me and all my awesomeness. Until Then - Happy Posting Loves!